Building on our success to help our advanced manufacturing sector recruit bright, hardworking and committed talent, the City of Mississauga’s Economic Development Office (EDO) is hosting another Building Skilled Talent Together Mississauga networking event on November 21st, Mayor Bonnie Crombie said today. “The event will give local manufacturers the opportunity to speak directly with federal, provincial and regional funding and service representatives who can provide funding options to de-risk the onboarding of new employees or upskilling existing employees,” Mayor Crombie added. 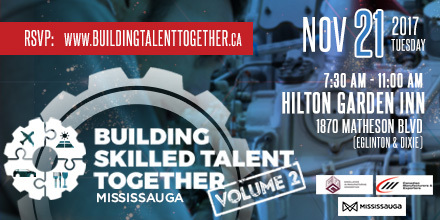 If you are a Mississauga manufacturing company with workforce development challenges and want to obtain direct solutions, please register for Building Skilled Talent Together Mississauga by clicking here. The program was kicked off by Mayor Crombie with an event that attracted 100 people from advanced manufacturing companies, education and industry associations to discuss the talent needs in Mississauga. This entry was posted in Carousel News, Innovation & Entrepreneurship Taskforce, Mayor's Initiatives, Mayor’s Youth Jobs Initiative, Mississauga International Partnership Program, News. Bookmark the permalink.